Have you ever had a question and either didn't know where to find the answer or were too afraid to ask? If so, you've come to the right place. 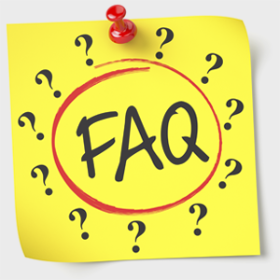 Here you'll find answers to common questions our clients ask. Just start by following one of the links below. How long does it take for you to complete my order? Is black considered a printing color? What do I need to provide for variable data projects? What do I need to provide for email marketing? Good question! We are a full service design and print company and offer a wide range of products and services. To see a full listing and samples of what we can offer you, check out the Project Portfolio area of our website. Well, since you are here, we would suggest you use our online Quote Request Form. Otherwise, the best way to ensure that we get all the information necessary to do an accurate quote, give us a call and talk with one of our Client Representatives. There is no real clear-cut answer for this one. As a rule, we always try to get a first proof to you within 5 busines days after receiving the order, and we can generally get a job on press and out the door within that same amount of time after approval. During the proofing process we aim to turn around proofs within one business day. Resolution should be set to 300 dpi/ppi at final output size. We won't be responsible for poor output quality from lower resolution images. Remember to include 1/8 inch bleed on all documents with art or photos touching the edge of the page, regardless of the program. NOTE: Native Word/Works files are not considered a print-ready format. We must reset these files to be compatible with our printing software. Some adjustment may be required and text and items may shift. NOTE: Native Publisher files are not considered a print-ready format. We must use conversion software to open these files and some layout adjustment is required. To include the 1/8 bleed in Publisher you must increase the actual file size by .25" - 8.5 x 11 should really be 8.75 x 11.25. You will need to have the full version of Adobe Acrobat PDF. If you don’t please download and use PDF PREFLIGHT from our CUAdvantage site. Download and follow the instructions. If you DO have the full version of Adobe Acrobat PDF please follow the steps below. No. Because white is the default color of paper, it is simply recognized as the absence of any ink. Yes, whether it is by itself or with one or more colors. Native Excel files or CSV files are the safest bet. CSV files are data files that have commas separating each field, and returns separating each line of data. To save time and hassle, it is always best to make sure your data is properly formatted with each piece of data in separate fields. We require a data file in either Excel or CSV format. This file should contain your members who have signed up to receive notifications from you. The minimum field we need is the email address field, correctly formatted. If you wish, we can personalize your marketing emails with a first name or other variable data such as a loan rate. NOTE: You may NOT email any address that has been purchased, rented, appended, harvested or in any way obtained from a third party or without the email address owner's awareness and permission. In addition, you may NOT email any address that was initially obtained more than 18 months ago and has not received any correspondence from you since that time. Join our email list to keep informed and receive our quarterly newsletter. Login to your Client Project Gallery for additional services.